Delivering Great Customer Experiences On Time, Every Time. Pallet Consultants began in 1996 in Pompano Beach, Florida. We are based in the United States and have full importing and exporting capabilites that enable us to service the entire globe. Pallet Consultants excels in the timely delivery of quality pallets through fine-tuned manufacturing and transportation operations. We serve grocery warehouses, produce packers, citrus growers, fertilizer and mulching facilities, and many other industries. The Pallet Consultants team has over 60 years experience in the pallet industry. 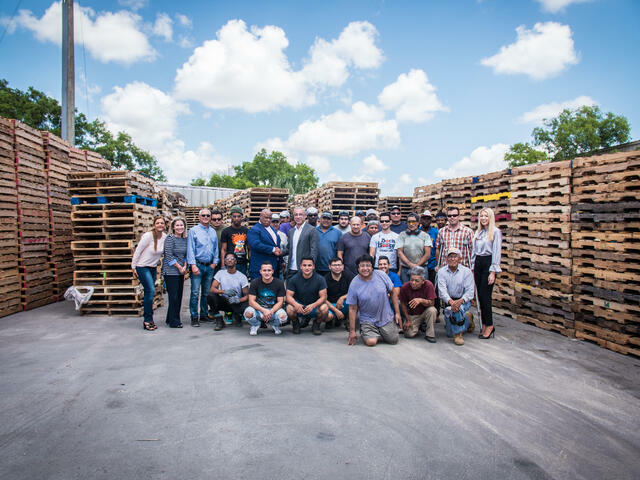 We design and tailor pallet programs for each customer providing recycled, new and remanufactured pallets. As a certified heat treatment facility, we meet all ISPM 15 requirements for wood packing material. As your partner and advisor, we're committed to providing you with outstanding customer service and top quality pallets to meet your every need. We have one simple philosophy: Customer satisfaction and manufacturing expertise go hand in hand. Pallet Consultants provides service within 24 hours throughout the continental United States. Whatever your pallet needs call for, we deliver anytime, anywhere in the United States. From new to recycled and everything in between, we've got you covered. We have 447 Trailers on the road - centrally coordinated and in constant communication. Over 600K recycled pallets delivered on-time, on-schedule each month. 97.6% On-Time Delivery. Our Operational efficiencies allow us to be competitive while delivering exceptional customer service. Constantly improving how we engineer the custom solutions for our clients. Good is never good enough. Over 75% of all orders are delivered within 24 hours. Our teams assume collective accountability for their actions. We excel at meeting challenging commitments as we achieve total customer satisfaction. The team to help you succeed. Our team of over 300 individuals is dedicated to offering the best service and giving every client the attention they deserve. Let's talk! Want to join our team? We're always looking for great talent to join us. Click the button below to contact us and get the conversation started.